Spring is officially here, which means you now have the perfect excuse to go on that much needed shopping excursion. Get ready to add some of these gorgeous trends into your wardrobe this season! The 70s are back and looking fabulous as ever. With a pair of high-waisted wide leg trousers you can achieve a chic, sophisticated look that is comfortable and easy to move in. Try matching your new pants with a thin belt and a pair of wedges to complete a slimming, lengthening look. 2. FloralsFall in love with mother earth through floral pattern blouses, dresses, and accessories. The fashion possibilities are endless with floral patterns that look stunning in both soft and bold color palettes. Make a statement by adding some bright, eye-catching colors into your outfit. Flaunt a vivid, solid-toned dress or mix and match with other lively patterns. For a small splash of color, you can enhance a neutral ensemble with your accessories by incorporating a neon belt or a vibrant clutch and matching heels. 4. Whites and Muted TonesAn all white outfit from head to toe is classic and timeless. Find different wardrobe elements in white and muted tones that feature lace, fringe, and other gorgeous detailing. Piece them together to create a look of elegance. 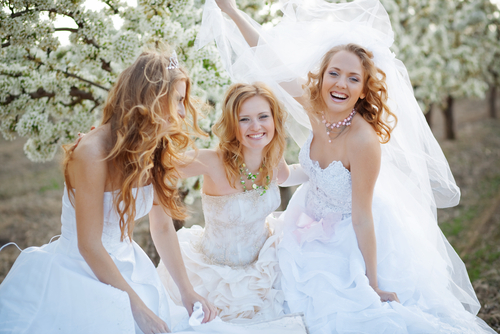 Weddings are the place to express your beauty, especially when you’re the bride. We want to celebrate our commitment in style- whether it’s our first trip down in the aisle or our fifth! When our mothers or grandmothers were young, a woman’s primary role was to get married and raise a family. The other options were considered less-than-ideal, to say the least. Only young, first-time brides wore traditional bridal regalia; everyone else was expected to marry with little fanfare, wearing a suit or simple dress. Thank goodness these archaic mores have been banished to the Dark Ages where they belong! The gown suits the venue. Go for glitz and glam for a formal, evening affair. Look for soft chiffons, breezy organzas or romantic lace for destination weddings or outdoor celebrations. Think casual, yet chic for a midday bash. Choose the style that flatters the figure you have, not the one you used to have, or the one you wish you had. You remember that comfort counts. It’s hard to look and feel fab when you can’t breathe, sit, or walk because your dress is too tight or about as supple as a suit of armor. It’s a reflection of your personal style. Many women assume that, as a bride, they should sport a veil and be decked out in a big white gown. Although this is certainly a classic bridal vision, it isn’t the optimal look for everyone. Factor in your personality, age, and lifestyle. Your guests will be baffled if you’re covered in crystals from head to hem, when they’ve never seen you wear a single piece of jewelry- much less a gown. Think chic and sophisticated if this is a second or subsequent marriage; leave the Cinderella look for the young, first-time bride. Embrace your maturing beauty and celebrate your motherhood! Look for matte fabrics and styles that skim your figure. A dress that’s tighter than the skin on a hot dog won’t make you look thinner; it will only highlight your figure flaws-as will shiny fabrics like satin. Well-constructed gowns with multiple linings and boning will help trim the “mommy middle”. Fitted properly, boning-those flexible, sturdy strips used in bras-is not uncomfortable and will provide welcome support to strapless dresses, while nipping in the waistline area. It’s perfectly acceptable to wear white, but a soft ivory, cream, ecru, or blush pink may be even more flattering to your skin tone. Rather than a full veil, accent your stylish gown with a jeweled hairclip, a wisp of French netting or a fabulous feathered fascinator. Good riddance to the days of quietly re-marrying (or getting married for the first time)! Your wedding should express who you- and your new family- truly are. Embrace your body and showcase whatever you love most about it. Most importantly: enjoy the day…and Best Wishes to the bride!